Looking for something a little more special for your pampered pooch? Well look no further! 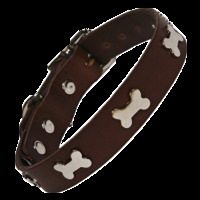 We have a stunning range of luxurious leather dog collars, all handmade for us here in Britain. We have a variety of colours and widths for you to choose from so you are sure to find the perfect leather collar for your dog. We have a selection of designer dog collars including the stunning ranges from Mutts and Hounds and Dogs & Horses. A good leather dog collar will last for years if treated right so they are definitely worth investing a little extra cash in. At Chelsea Dogs we sell designer leather dog collars from the top UK brands including Mutts and Hounds, Dogs and Horses and Creature Clothes. The range from Dogs and Horses will provide you with a simple ribbed leather dog collar or something more elegant like the perforated leather dog collars, available in 3 different colours. Mutts and Hounds have teamed classic brown leather with Balmoral Tweed and two different coloured organic ticking linens. Next we come to Tallulah Couture, some real show stopping leather dog collars with an abundance of different coloured crystals, beads and jewels, each hand stitched onto the softest coloured leathers. The possibilities are endless and these dog collars can be made in any size to suit the smallest teacup Chihuahuas or the largest Great Danes.